East Village Association | West Town Chicago: Chicago ward remap: Why not the 1st? Chicago ward remap: Why not the 1st? The East Village Association Board recently agreed unanimously to issue a letter to Mayor Rahm Emanuel, Ald. Richard Mell (who is leading the aldermanic remapping process), Ald. Proco Joe Moreno (1st), Ald. Scott Waguespack (32nd) and Ald. Walter Burnett (27th) formally requesting that the East Village be mapped entirely within the 32nd Ward. Adding urgency to the decision were recent comments from Ald. Moreno that his ward was moving west and the rapidly approaching ward remap deadline. Currently East Village is mostly within the 1st Ward, but is also in the 32nd and 27th. Being in three wards is obviously inefficient and the board believed that our organization’s voice should be heard on the remap issue. Over many years EVA has worked with Ald. Waguespack on various issues. We find that we share a very similar vision for our neighborhood. Furthermore, we appreciate his published development protocols and transparent process. We also believe that our best opportunity to be included in a single ward would come from being included in the 32nd Ward. Many of us, and our friends and neighbors, voted for Ald. Moreno. However, his recent decisions called into question his commitment to and his vision for the East Village community. When Ald. Moreno was elected, we were excited to have another alderman that pledged to really listen to us and work with the community in a transparent fashion. However, our recent experience with Ald. Moreno has been disappointing.  Ald. Moreno agreed to rezone a property on the Polish Triangle to allow a pawn shop.  Ald. 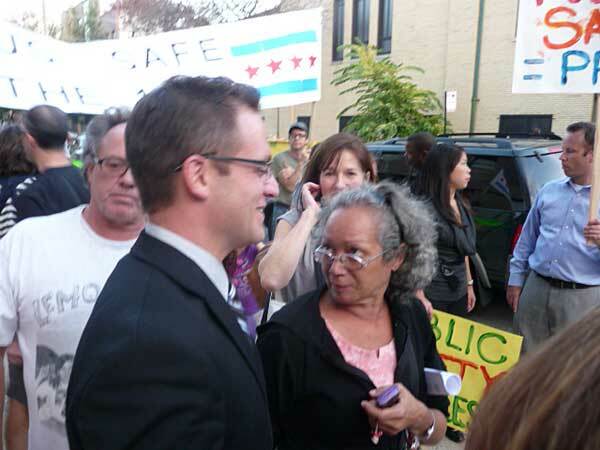 Moreno sponsored the legislation to lift the liquor moratorium so that CVS at the Division and Ashland can sell liquor. We believe liquor sales on the Polish Triangle will lead to an increase in crime and vagrancy. The granting of a license to CVS discourages locally owned businesses. Ald. Moreno ignored the requests of several community groups when making this decision. He sponsored the legislation and failed to communicate the decision to the interested groups.  Ald. Moreno also sponsored legislation to lift the liquor moratorium on Damen between Augusta and Division. The East Village Association voted against lifting this moratorium in a 2008 membership vote. The moratorium protects our community from increased crime and vagrancy. Ald. Moreno pledged to confer with EVA when making these decisions. He made several promises to various EVA board members that he would not lift this moratorium without EVA support. But in fact he emailed EVA's president less than 24 hours prior to introducing the legislation to lift the moratorium.  Ald. Moreno voted for the budget that eliminated the 13th District Police Station. The East Village formerly went on record opposing the closing of this station, and at an October public rally at the 13th District Ald. Moreno publicly stated he was opposed to the closing of the station. Yet Ald. Moreno failed to include preserving the 13th District in a joint letter to the mayor signed by him and 27 other aldermen. There are additional policy and process concerns regarding the demolition of historic buildings, development on Chicago Avenue and 1601 W. Division that preceded these concerns. In the event that all or a portion of East Village is included in the new 1st Ward, we encourage Ald. Moreno to be more transparent in his decision making and to respect the East Village Association as a partner in community planning and development. The ward remap is an opportunity for all concerned to re-evaluate and recommit to an open and productive relationship. Finally, we owe our membership a disclosure of the decisions that are made and the reasons for these decisions, even if that creates tension. The EVA bylaws grant the authority to make decisions at the executive level, the board level or the membership level. Over a two-year term as EVA president Greg Nagel has not made a unilateral decision, but time-sensitive issues are presented to the board. With reports that the 1st and the 32nd ward boundaries were in flux, the remap emerged as such an issue. Directors were polled by e-mail Nov. 17 on their position, and reviewed the letter before it was issued about 36 hours later. Not everyone will agree with the decision to issue the letter. However, time was of the essence, and we hope posts on the subject have kept the process transparent.